Venu Srinivasan, the chairman & managing director of India's third-largest two-wheeler manufacturer TVS Motor Company, is taking a leaf out of Ratan Tata's book. In a quest to garner a larger share of the burgeoning two-wheeler market, Srinivasan is hoping to emulate Tata's low-cost manufacturing processes for the Rs 100,000 Nano small car at TVS Motor to build cheaper bikes aimed at small towns and rural markets. "The introduction of the Tata Nano, the cheapest car in the world, made us take notice (of how to build low-cost products)... it is possible to manufacture low-cost products in the country," Srinivasan had said recently. His low-cost plans dovetail perfectly with the company's decision to make affordable new models and expanding capacity its priorities for this financial year. So far, the cheapest bike from the company, the 100cc TVS Star Sport, carries a price tag of Rs 32,000 (ex-showroom, New Delhi). Image: 100cc TVS Star Sport. This is not the first time the company has looked to provide low-priced models for commuters, especially those in rural areas. 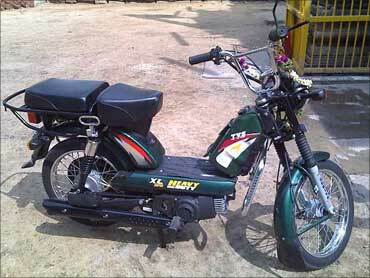 In 1980, the company launched TVS-50, India's first two-seater 50 cc moped. From then on, the company's portfolio of products has grown manifold. In 1984, TVS Motor was the first company to introduce 100 cc Indo-Japanese motorcycles. In 1994, it unveiled TVS Scooty, the first indigenous scooterette (a sub-100 cc variomatic). In 1996, it launched India's first catalytic converter-enabled motorcycle, the 110 cc Shogun. In 1997, it introduced India's first five-speed motorcycle, the Shaolin. 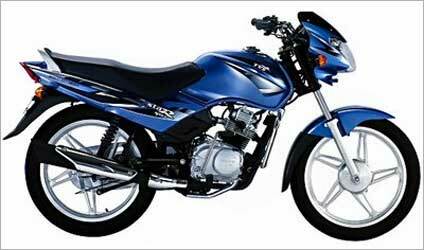 In 2000, it brought India's first 150cc, 4-stroke motorcycle, The Fiero. And in 2001, it released India's first fully indigenous motorcycle. "We will develop products that are specific to rural areas and are affordable," Srinivasan told his shareholders at the company's recent annual general meeting. He also highlighted the significant growth shown by small towns in the last financial year. According to the company, towns with a population of under 1 million, which accounted for 75 per cent of the industry's sales, grew 29 per cent, despite the restricted availability of retail finance. 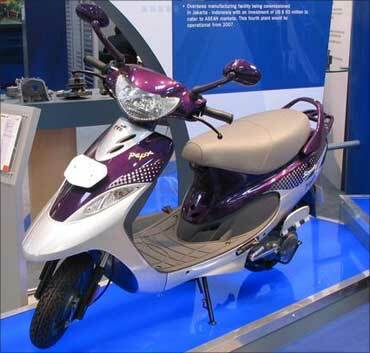 The company's mopeds, which are largely meant for rural areas, grew 30.3 per cent during the year. One of the recent measures announced by the company, aimed especially for rural areas, is the infusion of Rs 100 crore (Rs 1 billion) in its financial arm. The company is also working on alternate fuels and said it would look at electric vehicles. With the low-cost models, the company wants to provide users with international designs. Around 600 engineers are working on the development of these new products and in other advanced areas of technology. Sundaram Clayton, the holding company of TVS Motors, recently appointed 27-year-old Lakshmi Venu as director-strategy at the rank of managing director. 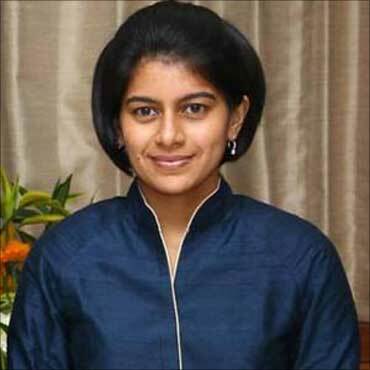 Lakshmi Venu is the daughter of Venu Srinivasan and soon-to-be daughter-in-law of Infosys chairman Narayana Murthy. The team is currently working on low-cost models across product segments. This would result in the creation of a new segment within an existing segment. TVS Motor is looking at international designs and new technologies for its product portfolio. This would help the company achieve its target of 17 per cent marketshare in the two-wheeler segment, from 15 per cent last year. The company has set a sales target of Rs 10,000 crore (Rs 100 billion) by 2012 and Rs 6,000 (Rs 60 billion) crore for the current financial year.